Looking for the highest professionalism in cranes, transport and hiab services? You've found it. Setting and maintaining that standard is our constant, all-embracing goal. We're a company determined to shape the future of our industry sectors. And that begins and ends with absolute commitment to serving people like you, our customers, with expertise and ability that are second to none. With an unmatched regional safety record, we've long been the first choice for the majority of industrial, building and construction companies in the Bay of Plenty. It's a reputation, we're glad to say, that's fast moving further afield. We're also specialists in rig logistics for the geothermal drilling industry in the Taupo region. Again, it's about unremitting customer focus and dedicated investment in customer service.. If we don't yet know you personally, we hope we soon shall. We're ready, right now, to serve you through the whole central North Island. If you're already a customer of ours - Hello. We hope this site will add to your understanding of our team, our values and capabilities. Whatever your needs or tasks, you'll find we apply industry-leading standards of responsiveness, advice and hard capability. They're the standards that have built our company, and we constantly seek to advance them..If you're as serious about performance as we are, don't settle for anything less. Availability? 24 hours, 7 days a week. Contact us anytime 0508 MCLEOD or O508 625 363 for a Lift. The office is closed from 5pm to 7am and on Weekends. McLeod Hiabs Win the 2015 NZ Construction Health and Safety Awards for Innovation! The team are very proud to once again be featuring at these awards. McLeod Hiabs were a Finalist for Leadership in the 2015 NZ Health and Safety Awards. McLeod Cranes were a Finalist for Leadership in the 2014 NZ Health and Safety Awards. 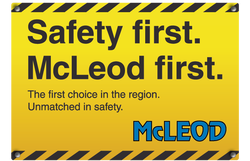 McLeod Cranes won the 2013 Site Safe Construction Health and Safety Award - for industry leadership. McLeod Cranes were Finalist for Small Business Award in the 2013 NZ health and Safety Awards. McLeod Cranes won the 2012 Small Business Award in the 2012 NZ health and Safety Awards. We're proud to enter these Awards, as rigorous, independent evaluations of our operational systems. The fact is, we eat, drink and live Health & Safety. And in these Awards, we're judged stringently. As finalists, and as previous winners, we're honoured to have such fiercely competitive recognition. It's informed, impartial endorsement of our efforts to create the safest work environments through sound lift planning and the creation of valuable industry standards. For those we work for daily, it's a key demonstration of our unswerving focus on operational excellence. Truth is, we bring the same focus to every single thing we do.